Understanding of allergies - Allergy is a reaction to the human immune system to something that is considered dangerous even though it is actually not dangerous. This can be a substance that enters or comes into contact with the body. Allergens or allergy-triggering substances only affect people who have these allergies. In other people, these allergens will not trigger an immune response. Some types of substances that can cause allergic reactions to include insect bites, dust mites, animal hair, drugs, certain foods, and pollen. When the body first encounters an allergen, the body produces antibodies because it considers it dangerous. If the patient's body returns to contact with the same allergen, then the body will increase the number of antibodies many times against the type of allergen. This is what triggers the release of chemicals in the body (histamine) and causes allergic symptoms. Swelling occurs in parts of the body that runs into allergens, such as the face, mouth, and tongue. Itching and redness in the eyes. The severity of allergies also varies in each person, there are those who experience mild allergic reactions and some who are severe to fatal results called anaphylaxis. If a person experiences anaphylaxis, it requires emergency medical care. The most effective way to prevent allergies is to avoid the trigger substances or allergens. But if allergy symptoms appear, there are some anti-allergic drugs that can help. Symptoms of an allergic reaction usually appear a few minutes after contact with an allergen. These symptoms can also develop gradually in a few hours. 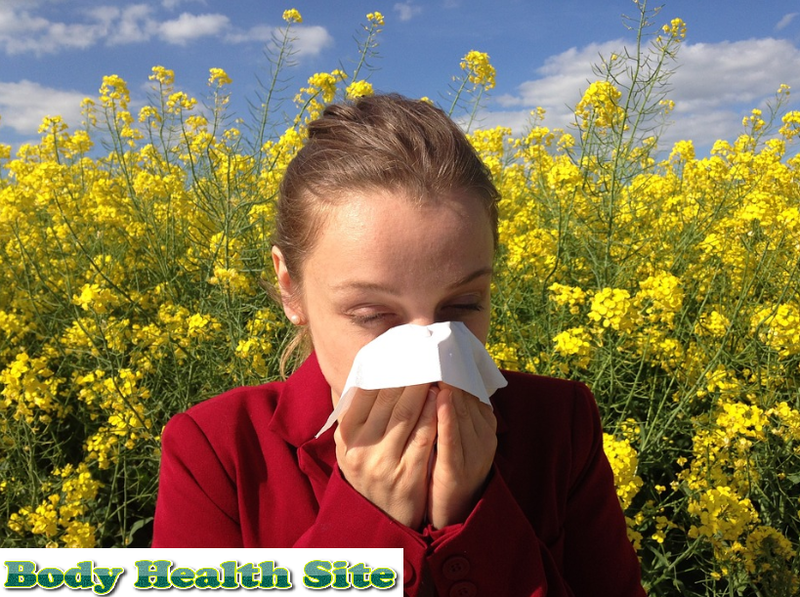 Allergy symptoms that we experience generally depend on the type of allergen and how we make contact with allergens. For example, allergy symptoms due to food will cause symptoms in the mouth or digestive system, while dust allergies will cause symptoms in the respiratory system. The following is a detailed explanation. In addition to swelling in the part that is bitten, this type of allergy can cause the appearance of itching throughout the body, coughing, chest tightness, shortness of breath, and severe allergic reactions (anaphylaxis). If you have allergies to airborne substances such as dust, pollen, or dust mites, the main symptom that you will experience is usually sneezing. These symptoms can develop into a runny or a runny nose that triggers breathing difficulties. Itching in the nose, red, watery, and swollen eyes can also appear. Allergies because certain foods can cause tingling or itching sensations in the mouth. Swelling occurs on the tongue, throat, lips, eyes, or face of allergy sufferers can also occur. In addition, this allergy can also cause itchy and red rashes on the skin, nausea, abdominal pain, and diarrhea. Medications can also cause allergic reactions. Symptoms can include itching of the skin, rash, swelling of the face, difficulty breathing and anaphylaxis. In addition to the above symptoms, allergies can also appear when the skin is touched by certain substances. For example soap, shampoo, perfume, or natural rubber (latex). This type of allergy will result in a type of inflammation of the skin known as atopic dermatitis. Atopic dermatitis causes symptoms of itching, redness, and scaling. If you have experienced the above symptoms, you should find out the cause so that you can discuss them with your doctor so that your allergies can be treated. Fainted due to decreased blood pressure. A fast, but weak pulse. Anaphylactic patients need emergency medical treatment. Anaphylactic reactions can be treated with injections or epinephrine drugs. Insect bites, such as bee stings. Certain foods, such as nuts, seafood, and milk. Substances in the air, such as animal hair, dust mites or pollen. Drugs, such as penicillin antibiotics. Allergens that come into contact with the skin directly, such as chemicals in perfume, soap, shampoo or latex ingredients. Allergic reactions occur when the body's immune system reacts to allergens which it considers dangerous, even though it isn't. Therefore, antibodies are formed called immunoglobulin E (IgE). When contact between the body and allergens returns, the body will produce more IgE. Then IgE will trigger the release of natural chemicals such as histamine which causes allergic symptoms. A person's risk of experiencing allergies can also increase due to heredity and the environment. This generally occurs in children. If your father or mother has certain allergies, children are also at high risk of having allergies, even though the allergens are not always the same type. Environmental factors greatly affect the risk of allergies. Research shows that the longer and often a person is exposed to certain allergens, the higher the risk of having allergies. Other things that can lead to allergies are smoking, pollution, infection, and hormones. At the initial stage, the doctor will ask for the details of the symptoms, the frequency, and timing of the appearance, and the allergens that you experience. The doctor will also examine the body parts affected by allergies. If your allergen is not known with certainty through the initial examination, the doctor will usually recommend several tests for further evaluation. A patch test is one test to diagnose allergies that is safe and not invasive. In patch tests, one type of allergen will be placed in a certain place, then placed on the skin for two days while monitoring the skin reaction. Patch tests are used to evaluate contact dermatitis. In the skin prick test, the patient's skin will be dropped by a common fluid allergen and then stabbed gently and slowly with a needle to see the reaction. If the patient is allergic to the substance, a red and itchy lump will appear on the skin within 15 minutes. This skin prick test is usually used to check the types of allergies in certain foods and drugs, allergens in the air, and poisons from insects. This test is safe and can be used by everyone. In addition to skin prick tests, patch tests can also be done. In patch tests, one type of allergen will be placed in a certain place, such as plaster, then placed on the skin for two days while monitoring the skin reaction. Patch tests are used to evaluate contact dermatitis. The type of blood test used is radioallergosorbent tests (RAST) which will measure the level of certain types of IgE in the blood. Blood tests may be recommended along with or to replace the skin prick test. In addition to seeing a doctor, you can also evaluate the allergens that you or your child experience by noticing the type of food consumed and the allergic reactions it causes to the body. If your allergy is suspected of being a food allergy, another recommended test is an elimination test. This test is done by avoiding the type of food that is thought to be an allergen to see the different reactions of the symptoms experienced. Then the same type of food is tried again after a few weeks to look forward to the next reaction. In some cases, food challenge tests are also carried out to see the reactions of patients with close supervision by doctors. During this test, allergens are given to the patient gradually. Although at risk of experiencing a severe allergic reaction, this method includes the most accurate in determining food allergies. In addition to seeing a doctor, you can also evaluate the allergens that you or your child experience by noticing the type of food consumed and the allergic reactions it causes to the body. This antihistamine drug works by inhibiting the effects of histamine compounds in allergies. Antihistamines can be used in the form of tablets, creams, liquid, eye drops, or nasal sprays, depending on the area affected by the allergy. Some types of antihistamines will cause drowsiness after consumption. So avoid consuming antihistamines that cause drowsiness shortly before driving a vehicle or engine. This drug is effective for treating inflammation in cases of allergies. This steroid drug can be obtained in the form of nasal spray, eye drops, creams, inhalers, and tablets. Side effects are less than corticosteroids in tablet form because they only work in one particular area and little is absorbed by the body. In addition to tablets and capsules, this drug is also available in the form of drops or nasal spray. Decongestants are useful to help relieve nasal congestion. This drug is only recommended for short-term use (less than one week). Leukotriene is a compound that can cause swelling of the respiratory tract during an allergic reaction. This drug serves to inhibit the effects of leukotrienes. This drug can be used in tablet form. If you suffer from severe allergies or that cannot be cured with other treatments, your doctor can recommend allergen immunotherapy (desentilisastion). In this therapy, small amounts of allergens are given to patients through injections, drops or tablets placed under the tongue. Giving allergens is carried out for several years. The goal is to familiarize the body with these allergens so they don't overreact. Even though it doesn't heal completely, this will make allergy symptoms lighter. If your allergy is likely to cause an anaphylactic attack, it is recommended that you always take the epinephrine injection that your doctor prescribes and use the injection in an emergency. You can also wear bracelets or necklaces that are allergic if possible so that if anaphylaxis occurs, people around you will know the cause and act as quickly as possible. Prevention of allergies depends on the allergens. The best and most effective way to prevent allergies is to avoid the trigger. But not all allergic sources can be easily avoided such as dust mites, pets, or food. The following suggestions can help prevent allergies. Wear closed clothes or apply insect repellent lotions while traveling. Avoid as much as possible using perfume or fragrance that can attract the attention of insects to get close. Use a mask when leaving the house. Clean the house regularly, especially rooms that are often used, such as bedrooms and family rooms, to avoid dust mites. Avoid using duster because it can spread allergens. Wipe the surface of the furniture with a clean cloth dampened in water or cleaning liquid or use a vacuum cleaner. Open a window or door so that air circulation is more smooth so the room does not feel damp. Place your pet outside the house or in just one special room. Bathe pets once a week. Record the type of food that is likely to be a source of allergies so that it can be avoided. Always read the packaging label to find out the ingredients used before buying food. Asking for food ingredients that are used in detail before ordering them in a restaurant. Clean the kitchen to avoid moss, especially washing dishes and washing clothes. Do not hang clothes in the house. Use a wristband that informs you that you have severe allergies so other people know, especially when you can't communicate when an allergic reaction comes. Watch yourself if you have anaphylaxis because if an allergy recurs and is not treated as quickly as possible, you risk losing consciousness or even death. You are advised to always carry two doses of epinephrine to be used immediately if an anaphylactic attack occurs. Also, tell how to use the injection to the closest people so that an injection of adrenalin can be given while waiting for medical help to arrive.